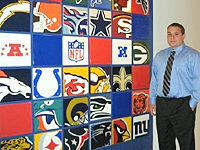 Mike Tannenbaum '09 poses for a photo while interning at the National Football League. I arrived at Ithaca College as a sport media major hoping to land an internship with a professional sport organization or team, preferably within the world of hockey. Working with college athletics had never crossed my mind until an opportunity with the sports information office presented itself shortly after my arrival in Ithaca. I was excited to have the opportunity to work in Ithaca’s sports information office, which runs the College’s athletic website, compiles team scores, and writes the press releases related to intercollegiateteam play. I dived right into my new job with passion and enthusiasm. During the final week of classes in the fall ofmy sophomore year, one of my professors, Ellen Staurowsky, informed me that Harvard University was looking for an intern for the spring semester. I was qualified for the position, as I had the necessary sports information knowledge from working in the Ithaca office. She encouraged me to apply, telling me it was worth taking the chance. I applied but didn’t get a response for weeks. Despondent, I had given up hope that I would even get an interview. But while I was home for winter break I received a telephone call from Harvard’s athletic communications office. After a brief phone interview I was asked to fly out for a face-to-face meeting. Without hesitation, I agreed and booked my flight. During my one-day whirlwind trip I met several staff members and attended the women’s basketball game against Binghamton that evening. After a late dinner with the staff, the athletic communications director offered me the position. Without a second thought, I accepted. I arranged with IC’s sport management and media department to take the semester off and complete my full-time internship. On my first day in mid-January, I became acquainted with the office and my coworkers and learned that I’d be providing coverage for softball and men’s and women’s tennis. My responsibilities included scoring all home games, writing and distributing press releases for each sport, and completing the game program for all home contests. A huge ice hockey fan, I volunteered to help with hockey games whenever needed. 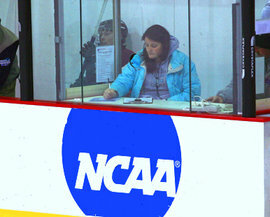 It wasn’t long before I became a fixture at both men’s and women’s ice hockey games, completing the NCAA score sheet. As time went on, more opportunities became available. In early February I attended the men’s Beanpot, an annual hockey tournament in which four Boston area college teams (Harvard, Northeastern University, Boston College, and Boston University) compete for the Beanpot trophy (read more about the Beanpot below). Later in February, Harvard and Northeastern hosted the NCAA Women’s Basketball Final Four, and my coworkers and I were media relations representatives for the NCAA. I was responsible for obtaining quotes from student-athletes and coaches, transcribing the dialogues, and releasing them to the media. A lifelong basketball fan, I never imagined I would attend a Final Four tournament, let alone work the event and sit courtside for the championship game. The day after the championship a few of us attended the WNBA draft, and in April I traveled with the Harvard women’s tennis team to Evanston, Illinois, for the NCAA tournament. 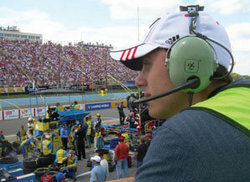 Later that month I was hired by ESPN’s SportsTicker to cover a Major League Soccer match at Gillette Stadium in Foxborough, Massachusetts. I was on top of the world, accomplishing tasks I never thought possible, and I was just 19 years old. And when the internship ended, I stayed on as a student assistant to help with an archiving project for another month. It was an unbelievable experience that I will never forget. After returning to Ithaca, I was given more responsibilities in the sports information office because of my Division I experience. I became the contact for the student assistants on football weekends and managed coverage of all participating teams, making sure the scores were put on the website in a timely manner along with other information on each contest. Last May I was invited to return to Boston, where I helped my Harvard coworkers as they hosted the 2008 NCAA Men’s Lacrosse Championships. 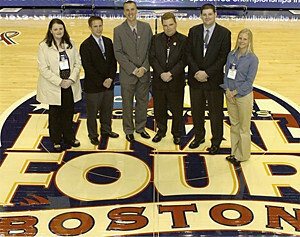 The volunteer staff was composed of sports information professionals from around the area. My duties included distributing materials to the media, taping and transcribing press conference quotes, and helping in the statistics booth. My four years at Ithaca, my IC sports information job, and my internship furthered my development in the sports information industry. I recently returned to the Division I level as one of three sports information interns with Michigan State University, where I’m covering men’s soccer and softball and helping during home football games and women’s basketball contests. I’m well on my way to talking about sports for a living, and it is all due to IC and these great internship experiences. How cool is that? 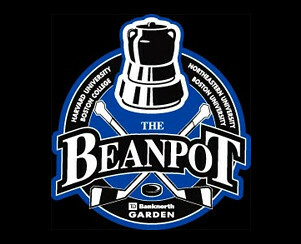 The Beanpot debuted in December 1952 as a contest between four of Boston’s most celebrated colleges: Harvard University, Northeastern University, Boston College, and Boston University. The winning team gets a trophy and bragging rights as Boston’s best. Now in its 57th year, the Beanpot shows no sign of waning in popularity. The whole community gathers from near and far for this annual event. And it’s not just men’s hockey either; the Beanpot is one of the longest-running women’s tournaments in all of college sports.